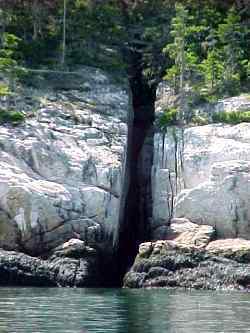 ----- Cruising the Maine coast without some knowledge of the fascinating geology would be like visiting an art gallery with half the pictures turned to the wall. -----Maine is rocky, no doubt about it. 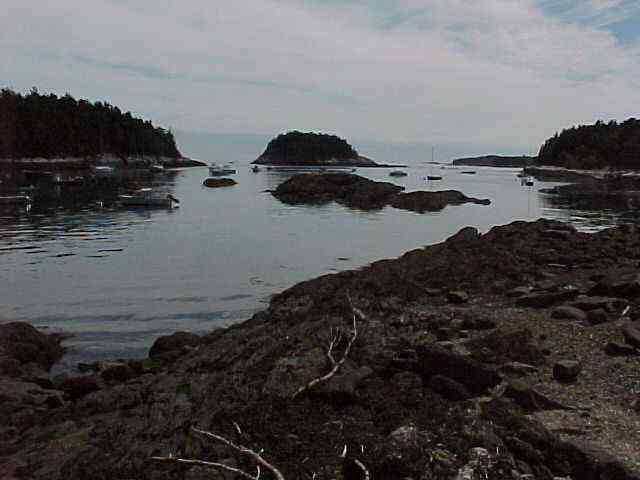 Most of the charts along the coast show marvelous displays of rocks, with precious little blue space between. The charts show rocks using the symbol *. Except, most passages look like this: * * **** * * ***. In fact, come to think about it, cruising the eel ruts and gunk holes here can be a *** experience. Nixon could delete expletives, but here you can only dream of deleting the ***. 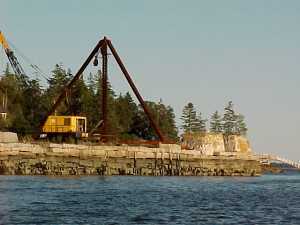 In truth, we wouldn't want Maine without those rocks - it's how we define Maine. -----We have cruised the east coast from the tip of Florida to New Jersey - mostly sand and mud. Then, we came into the Hudson and Connecticut - rock. Massachusetts, New Hampshire, and the southerly coast of Maine have a lot of sand, with interspersed rock, but from Portland north - ROCK! A curious person might ask, "Why?" A geologist not only wonders why, but makes it his business to find an explanation. The solution suggested by geologists is stranger than fiction. -----To begin, geologists banter time about the way astronomers talk of distance - or politicians talk about money. Let's reduce time to a scale we can more easily understand. The oldest rocks found on Earth are in western Australia. They are 4.1 billion years old. Let's compress those 4.1 billion years into one year, for our scale model, making 4.1 billion years ago January 1st. OK? 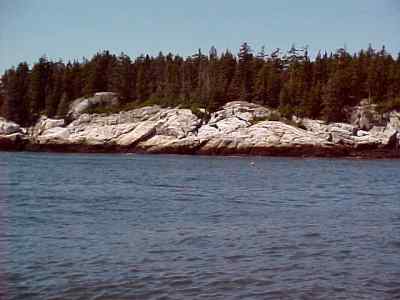 The oldest rocks in Maine are about 1.6 billion years old. On our calendar, they were formed about the eleventh of August. So our history story has the first half ripped out! Ah, but the last half is quite a tale! -----Once upon a time, long long ago, on November 10th on our scale calendar (maybe 500 million years ago, give or take a few million), North America was basking in the sun, minding it's own business. Sea critters with hard shells were hanging out on the shores, reveling in their newly designed defense system to protect them from predators (the predators were chuckling, since they were evolving drills!) Land was barren, absolutely devoid of life - no animals, not even plants - except maybe some scudge in ponds. The nearest continental neighbor to the east was a distant continent, perhaps the size of Australia, lying far over the horizon, somewhere between us and the west coast of Europe. This continent has a name that could have been created by a travel agent - Avalonia. "For your next Holiday - take a cruise to Avalonia. We have discount tickets available, and it's only a three-day cruise across the Iapetus Ocean to its sunny shores." -----Whoa! What ocean? Well, understand this tale is of a long-ago time in Never-Never Land. Iapetus, in the colorful mythology of the Greeks, was the father of Atlantis. And, in that ancient time, the ocean that separated North America from Europe (and Avalonia), existed before the Atlantic Ocean - hence the paternal predecessor must have been Iapetus! -----OK. So, Avalonia sat over the Iapetus ocean horizon, far to the east of Maine. Well, Earth is a restless place. The crust on which we live is very thin (much thinner than the skin of an apple relative to the juicy interior.) The interior under our crust is also juicy - and a tumultuous place. Dante was geologically savvy putting the Inferno below. Down there, it's hotter than the shingles of hell and squeezed with all the weight of overlying rocks (not to speak of your house and the nearby supermarket). It seethes and squirms, roils and boils, like a pot of oatmeal on your stove. All the movement below shifts the light-weight crust above hither and thither. -----Well, one of those upwelling heat surges rose under Avalonia in mid-November (370 m. y. ago), and started shoving it westward toward North America (reducing the width of the intervening Iapetus Ocean and the fares aboard those mythical cruise ships). Every myth needs the good guys, the White Hats, and the bad guys, in the black Stetsons. Well, for us and most air-breathers, Avalonia (and all continental masses, for that matter), was the White Hat. Let me explain. Avalonia (and today's continents) was composed of light-weight light-colored continental-type rock - the White Hat. 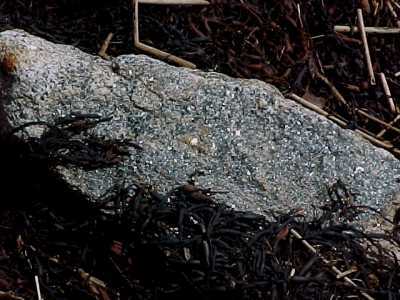 These light rocks (like granite or sandstone) are mostly composed of silica (the stuff of glass and most sand). They float high above the underlying black cauldron and make landmasses. 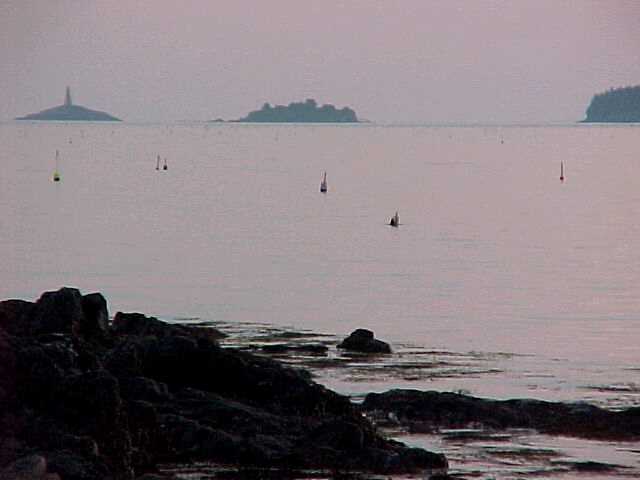 Like ice bergs, they are thick masses with only their tips showing above the surrounding sea of black rock. -----Yes, the sea floor beneath oceans is black, composed of iron-rich, heavy rock - the Black Hat. These heavies are mostly black basalts (the stuff of black lava flows). Oceanic crust, in contrast to the "ice bergs," is thin. Both are shoved around by the underlying cauldron of black stuff. Oceanic crust is, naturally, overlain by ocean - since it is heavy, it is the low area of earth. Water runs off the high, light-weight continents and pours into the lowlands making oceans of water. -----Now, back to the tale. When we last heard about Avalonia, it was blithely cruising to the west, shrinking the Iapetus Ocean. The sea floor beneath that ocean, was thin, heavy, dark and sunken. The advancing thick mass of Avalonia shouldered its way westerly like a Sumo wrestler moving through a crowd at the mall. It shoved the thin, heavy sea floor, ahead of its advance, down into the fiery cauldron, an ignominious end for the Black Hat. -----Where do we find such volcanic rapture today? Japan. Ah, Mt. Fuji. Japan is an arc of volcanic islands overlying sea floor being shoved to the depths. Indonesia, the same - over sea floor being shoved down by a northward cruising Australia. These island arcs are like a bow wave ahead of an advancing supertanker. -----Not all rising light-weight blobs break through the crust. Many, especially those that intrude into the overlying thick continental crust, cool and freeze beneath the surface. Most blobs are shaped like upside-down raindrops - the shape of the rising globule in a 'lava lamp.' The intruders are usually granite. 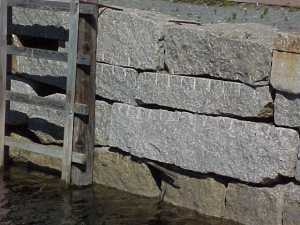 -----Thus began a major industry (much later in our geologic history) for folks on the Maine islands - quarrying, shaping, and shipping granite. The collision of Avalonia and North America crushed the intervening volcanic island chains and sediment piles between the two massive behemoths. The incredible compression folded, deformed, and baked the lava, ash and sediments. The intense heat and pressure baked everything into a mélange of dense metamorphic rock, intruded with blobs of granite - the 'basement' of New England. -----Those churning heat cells in the stygian depths are fickle. In mid-December (150-200 m. y. ago), magma began to rise close to and parallel with the suture zone of those combined continents. Huge rifts formed as black, basaltic magma bulged and ruptured the continental crust. -----The rifts that formed over upwelling magma mounds were often in the shape of a giant Y. Geologists call them Triple Junctions. Many such Triple Junctions formed along what is now the eastern edge of our continent. As the rising heat shoved upward and apart beneath the Supercontinent, two of the arms of one Triple Junction would join with two arms of a neighboring Triple Junction and so on until a jagged single fracture formed. Pangaea rifted asunder along that Superfracture. The rift lay parallel to the equator and cracked Pangaea into two huge continents - Laurasia (North America, Europe, and Asia) and Gondwana (South America, Africa, Antarctica, Australia, and India). Dinosaurs stalked those continents - strolling solid ground between Maine and Ireland. They were now separated from their southern hemisphere cousins by a growing ocean. -----Just before Christmas, (100 m. y. ), hot convection cells pressed upward and apart beneath both Laurasia and Gondwana. Jagged fractures opened over the bulging continental crust. The arms of new Triple Junctions joined creating new northeast-southwest Superfractures. Like the opening of a zipper, from south to north, North America and Africa-Europe split apart along the rift. By December 25 (70 m. y. ), the opening zipper had reached Maine. The last of the great dinosaurs said 'adios' to their European relatives, waving across the seawater-filled rift that was the opening of the Atlantic Ocean. Shortly thereafter, those 'terrible lizards' witnessed the flash of an incoming meteor that smashed a huge crater into Earth near where the Yucatan peninsula is today. The impact blasted gigatons of pulverized Mexico into our atmosphere. The debris encircled the earth, blocking solar heat. The dinosaurs breathed their last in the dust-choked freezing atmosphere of a millennia-long winter. -----Rid of those horrific critters, let's return to the story of Maine. To keep us located, we check our GPS on December 25th - N 35 W 40. Maine is today N 45 W 69. So in late December, our continent had rotated 30 degrees counterclockwise and to the north, and has continued northerly and westerly since then. Our continent had an eastern seaboard again, and Atlantic surf pounded the coast of Maine. -----Something new had been added to New England - major cruising grounds, occupied by rivers or bays. The rifts that split Laurasia were jagged. Remember those Triple Junctions? Two arms of one joined with two of the others and opened the Atlantic Rift, right? - but they had three arms - that leaves one arm at each junction unaccounted for. 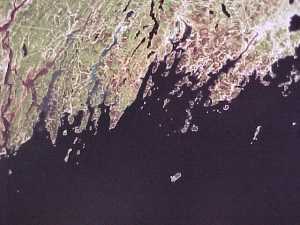 Those "failed arms" are today occupied by the Bay of Fundy, the Hudson Estuary, and the Connecticut River. -----Something else had been added to the New England coast - a slice of Avalonia. The Atlantic Rift, that split us from Europe, opened to the east of the old suture line between Avalonia and North America. Avalonian rocks were left behind, like a rocky calling card, firmly attached to our continent. North America, by the way, is still moving westerly. The Atlantic grows slowly wider every day at about the same rate your finger nails are growing. -----It is early evening, on December 31st, on our scale model year. Somewhere, probably in Africa, the first humans walked upright through the forests. As the evening progressed, those who had walked to northern Europe and Asia, were forced to live in caves and build shelters - winters were becoming progressively colder. They donned animal skins as temperatures grew colder. Finally, winters became so cold that the snow on the highlands didn't melt in summer. The snow pack grew deeper every year, compacting into ice. As the mounds of ice grew, it began to flow outward in all directions like pouring pancake batter on a griddle. Finally, about 10 pm on December 31st, the mounds of ice coalesced into vast ice sheets, thousands - eventually tens of thousands - of feet thick. Most of our northern continent and Europe looked like today's Greenland, with only a few mountain peaks rising above the Ice Sheet. Ice Age humans retreated southerly before the advancing ice. They hunted giant mammals - mammoths, giant elk, and huge ground sloths larger than Grizzly Bears - in ice-free valleys along the edge of the mile-high glacier. Mean global temperature fell at least 5 degrees below today. -----At least four times the ice melted back virtually to extinction, only to advance again. Since the last ice sheet was the most extensive, it obliterated much of the evidence from the earlier fluctuations, so perhaps there were as many as 10 major advances. So much global water lay as ice on the land, sea level fell at least 400 feet, and bobbed up and down with each period of glaciation. 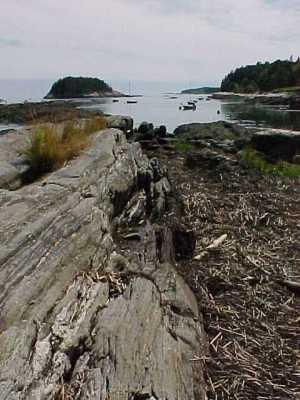 During glacial times, the coast of Maine lay 180 miles east of today's coastline. 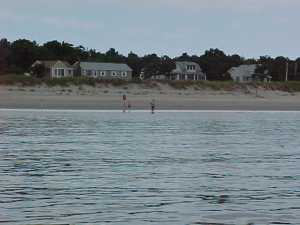 Natives walked to George's Bank, and fished from shore. Trawlers dredge up ice-age axe heads and hearths hundreds of miles off today's coast. -----The glacier, up to two-miles thick, weighed many tons/acre. (A reader, Rusty Simpson, calculated 12 million metric tonnes per acre). 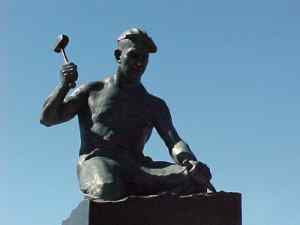 Armed with sharp rocks and sand, the massive sliding weight was a fearsome carver of the land. Sharp rocks scratched striations parallel with the direction of ice movement. 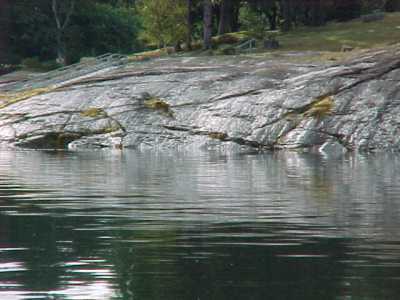 Larger rocks sometimes gouged deep grooves into the underlying bedrock. The fine silt, mud, and sand, pressed downward by millions of tonnes of ice, polished and smoothed the rock surface like a gigantic sandpapering machine. -----Soil was scraped from the valleys by the ice leaving bedrock exposed. Even mountains were shaped by the ice - - streamlined in a north-south direction with their tops planed and smoothed. In this photograph, ice moved from right to left, smoothing the mountain side that faced the ice advance and plucking and ripping rock off the side 'downstream' from the flow direction of the glacier. Moving glacial ice shaped this granite hill, sliding up the face, smoothing and polishing the rock. -----Then, as the weather ameliorated, the ice sheets slowed and melted. The horrendous load of rock and soil carried within the ice was deposited over the land surface as heaps of rock, gravel and sand. -----Along the western flank of Cadillac Mountain, in Acadia National Park, the Ice Sheet flowed down a north-south valley, carving deeply into the bedrock and scouring the valley walls. 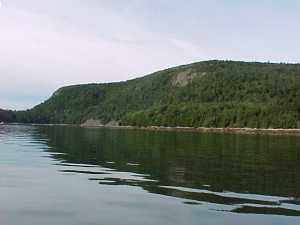 Ice-carved valleys are typically U-shaped, and this valley is flooded by the sea - Somes Sound - one of the few true fjords in the continental United States. -----The heavy ice was a burdensome load to bear. 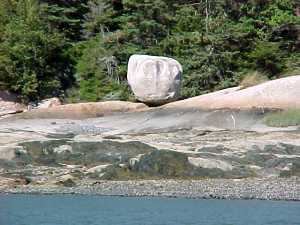 The light-weight crust of Maine, floating on the black rock substrate, slowly bowed down and sunk under the massive weight of ice. Much of coastal Maine was well below today's sea level. The edge of the glacier calved ice into the ocean far to the east of the present-day coast. -----The last glacier advance ended at two minutes before midnight on New Year's Eve. Global warming was swift, and the ice melted off the land faster than the down-bowed crust could rebound. 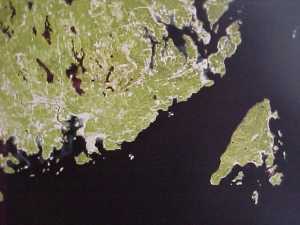 The ocean, flooded with glacial water, flooded inland over the depressed coast. Surf crashed against a shoreline that was about 100 miles inland from today's coast. Slowly the land rose, freed from the awesome weight of ice, until the coast matched today's charts. -----But Earth is in constant change. For reasons unexplained, the coast of Maine is bowing downward today. Too many shopping outlets in Freeport? Actually, the two ends of the coastline are sinking, with the top of the arc near Rockport. The subsidence is considerable - Eastport is dropping three feet per century. Portland, a century from now, will be ten inches lower. With current global warming trends and the melting of glaciers worldwide, sea levels are again rising. Coupled with Maine's sinking, today's investment in shoreline housing might be swept out to sea and the best long-term investment in ocean views might be miles inland from today's coast. -----A casual glance at a face often reveals a clue to the character within. Wrinkles, folds, and curves give evidence of a person's past. So it is with maps. 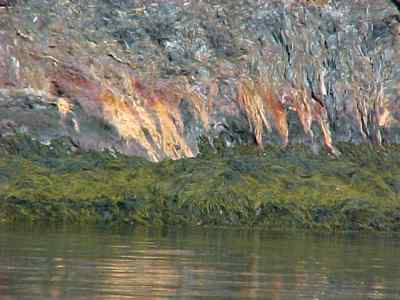 A perusal of a map of coastline Maine quickly reveals its geologic nature. 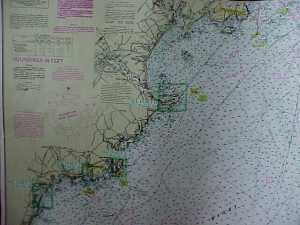 The southwest coast, from Kittery to Portland, is a series of curves - arcuate bays separated by five headlands. This area is more akin to the rest of New England - broad beaches of glacial sand reworked by ocean currents with occasional resistant bedrock headlands. 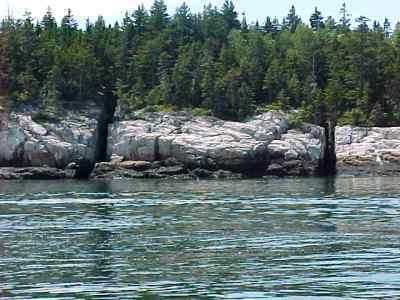 -----The area from Portland to Rockland, encompassing Casco Bay, the Midcoast, and Muscongus Bay, is a completely different character. This is the quintessence of Maine - rugged and craggy. Like the face of an elderly lobsterman, long at sea, the coastline is furrowed and experienced. Long, straight, parallel and narrow peninsulas jut out into the ocean, separated by equally long narrow embayments. 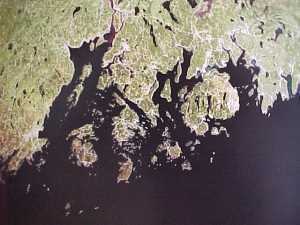 The ragged necks end in a series of on-trend rocky islands and shoals. On the map, it appears that a great fleet of narrow ships is anchored to a northeast wind against the shore. Many have a string of dinghies hanging behind. -----In geologic actuality, these are the tops of folded ridges of hard metamorphic rocks. These were the volcanics and sediments crumpled like the edge of a carpet by the collision of Avalonia. 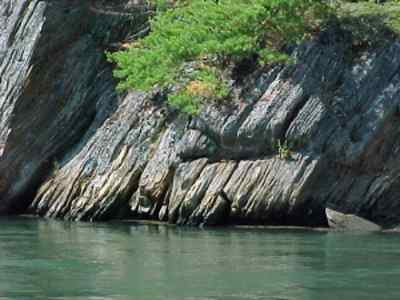 During times of glacially-lowered sea level, rivers followed the downfolds, or trends of less-resistant rock, scouring valleys that are now occupied by bays. -----Now check the coast from Rockland to Machias. Features here are more rounded. Islands and points are plumper. Large bays - Penobscot, Blue Hill, Frenchman, Pleasant and Chandler - fill between the middle-age bulges. 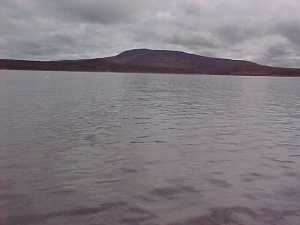 -----There are fat, swollen, roughly circular mountains capping the islands or coastline - Mt. Megunticook, the Camden Hills, Mt. Desert in Acadia National Park. These are granite domes, the massive intrusive blobs of regurgitated light-weight stuff that veneered the Iapetus sea floor before it was shoved down to the stygian depths under Avalonia or the continental margin of North America. There it melted, differentiated and intruded upward, cooling in the crust deep below land surface. 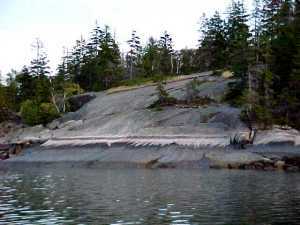 Erosion has scoured off the overlying rocks, revealing the tough resistant granite of the intrusions. Glaciers, miles-thick, have worn and smoothed their exposed surfaces. 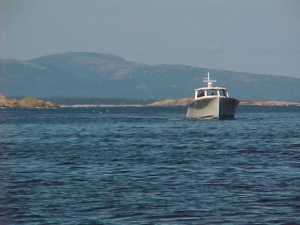 -----The coast from Machias to Eastport is straight, and almost devoid of harbors. This is an anachronism in Maine - almost a heresy. The myth calls for rough and craggy. The linearity of Down East is a fault, literally and figuratively - the boundary fault of a failed arm of a Triple Junction - the "failure" that created the Bay of Fundy. -----There are a few loose ends to clean up, at the end of such a long tale. There's a bit of out-of-place sand - the long beautiful beach at Popham, in Midcoast Maine. 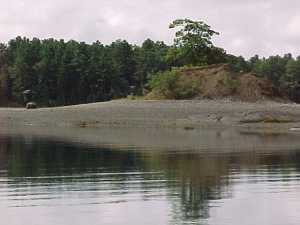 Sand belongs to the west and south, but this beach owes its existence to the great volume of glacial sand hauled to the coast by the Kennebec River. Unceremoniously dumped into the sea, it creates a giant sand playground for children and a strolling beach for adults. Offshore, however, it kills. The falling tide creates a rushing outflow from the Kennebec - we experienced six knots. Against a wind and ocean swells, waves crash over each other in a confused pile of lofty breakers. 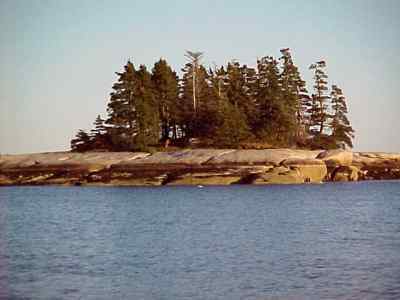 Kennebec sand lies just below the surface in the Popham Shoals - a dreaded place for mariners and graveyard for many. -----Lastly, some folks enjoy taking a close-up look at rock. The pretty colors and sparkles not only carry evidence of their chemistry, they also bear the marks of their environment. 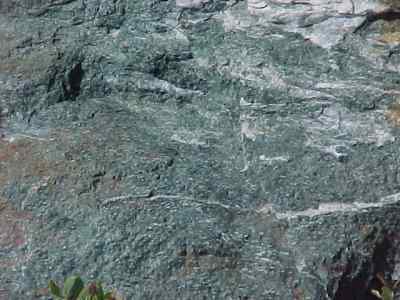 The metamorphic rock crushed between Avalonia and North America bears evidence of the amount of heat generated in that collision - rather like the color of a steak ordered rare, medium or well-done. About half of Maine, and the coast from Penobscot Bay to Machias, is medium rare. Rather than the juicy red of a steak, low-grade metamorphism results in a green mica-like mineral - chlorite. 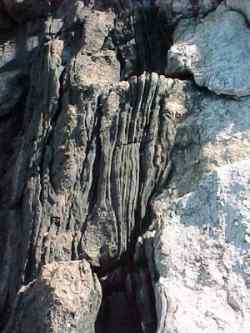 -----Where pressures and temperatures were higher, Maine cooked to medium and a black mica, biotite, resulted. 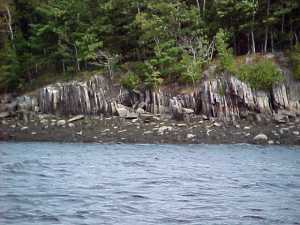 Black micas are found along the top and west side of Penobscot Bay and south of Portland. -----Well-done Maine is around Portland and the northeast of Muscongus Bay. 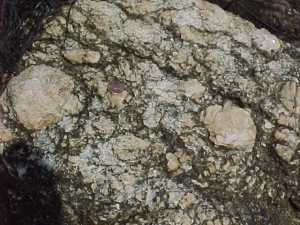 Here the rock contains tiny reddish-purple garnet crystals. There are some areas that were heated to a crisp, but they are characterized by minerals that are hard to see. We'll leave the charred bits to geologists - they need to make a living, also.